One advantage to dating a chef, besides the obvious fact that it’s nice to have a man who can cook, is that exotic ingredients sometimes make their way into my kitchen unannounced. Like the other night when he walked in with these. They basically look like skinned potatoes with the ends cut off – nothing special. You can see something special is going on with these things. Never in my life had I seen or even heard of anything like it before. I had no clue what it was, and after looking at it, all I could tell was that it was pretty. 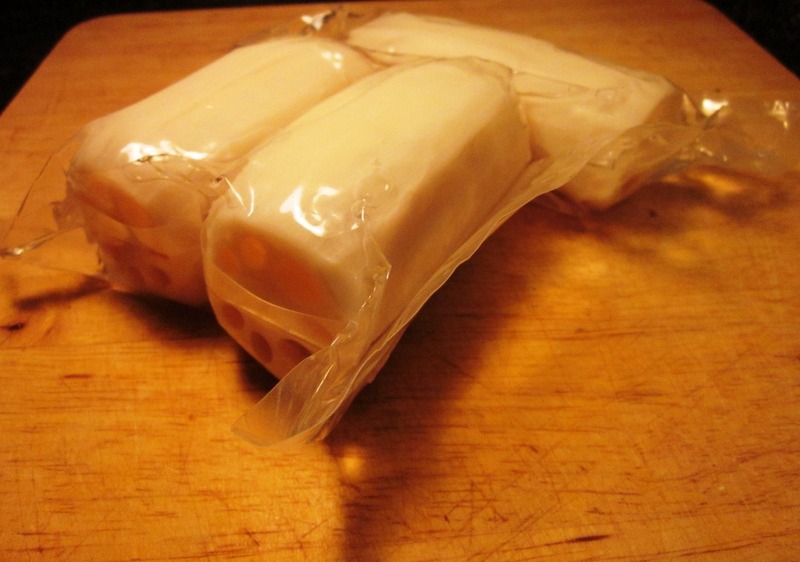 It’s kind of sad how excited I was all day yesterday to go home and experiment with the lotus root. I use the term “kind of” loosely to mean extremely. 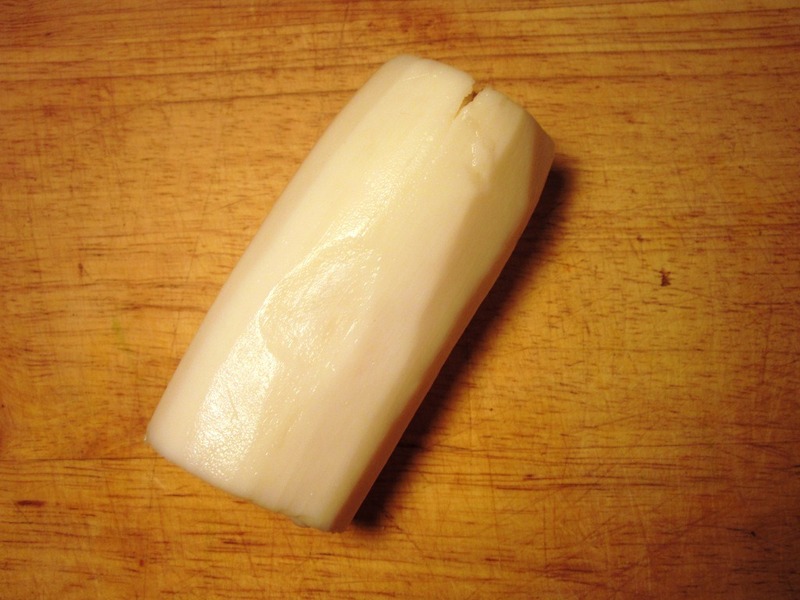 I ended up slicing up one of the roots thinly. I seriously could not get over how gorgeous it was. 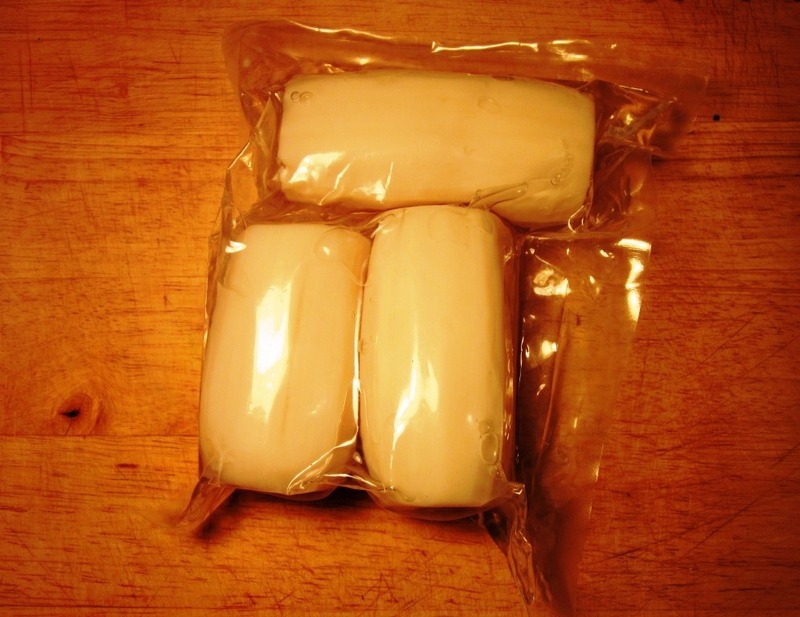 I prepared the lotus root in the simplest way – by sauteing it in 2 tsp canola oil. They soaked the oil up right away and I flipped them when they were barely browned and cooked them evenly on the other side. Then I set them aside off the heat while I chopped up some Asian-esuqe things to go with the lotus root that I had on hand to make a stir fry. 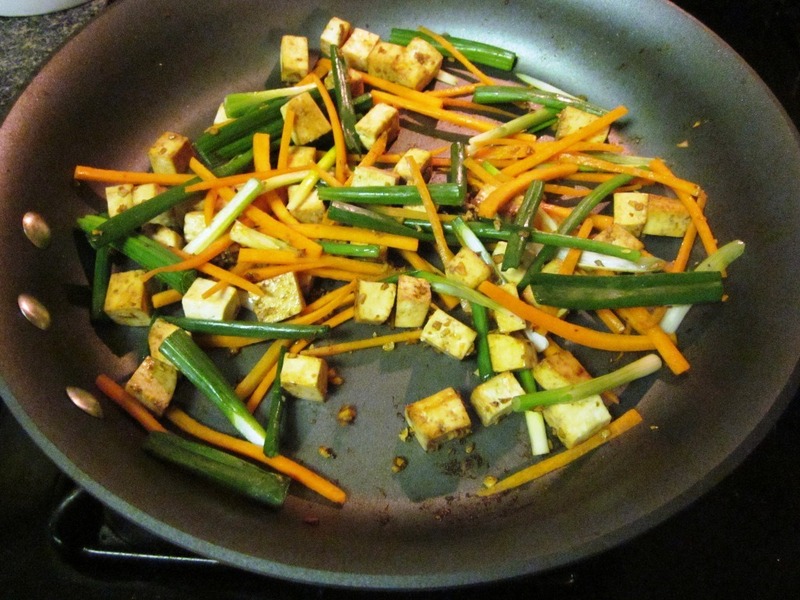 Tofu, carrot, green onion, garlic, and ginger. I cooked that all together plus a little nonstick spray and some soy sauce. Once that mixture was cooked through, I tossed the lotus root back into the mix, and served the stir fry over some coconut rice (recipe coming soon). This was seriously the best dinner I’ve made at home in a long, long time (and I’ve made some pretty incredible dinners recently!). 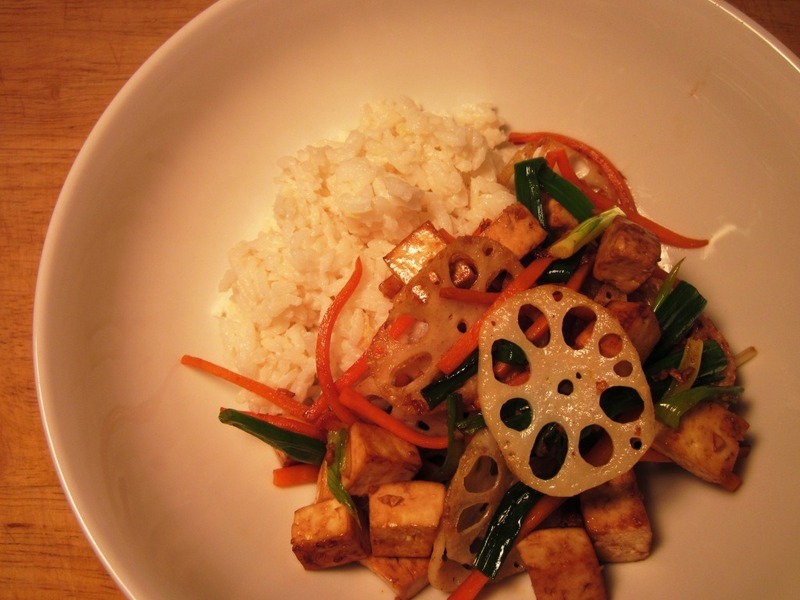 The texture of the lotus root was perfect – a little softer than a water chestnut, but still slightly crisp. From cooking them the oil, they took on a caramelized flavor and were edging on sweet. And the coconut rice I served them with? We won’t even go there. Heaven. I seriously cannot wait for lunch so I can eat the leftovers. Let’s see how long I can make it. 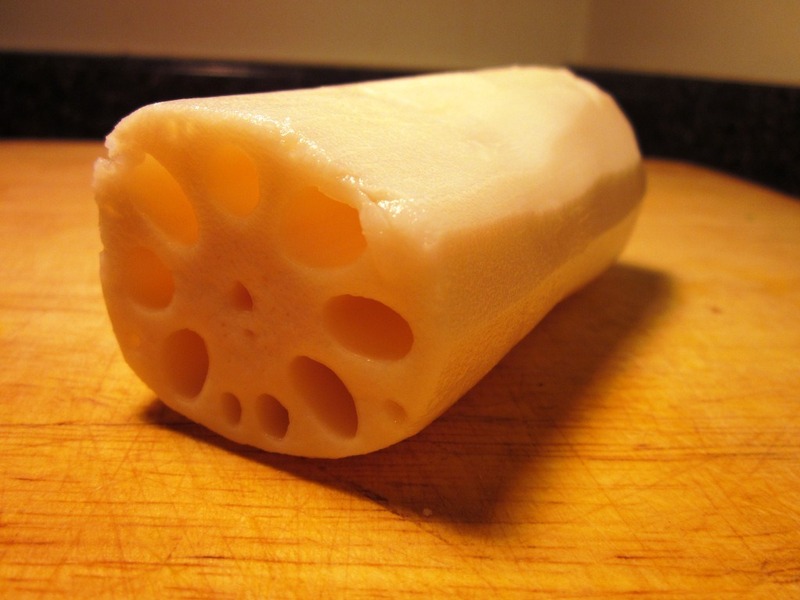 Have you ever heard of or seen lotus root before? What’s the most exotic ingredient you’ve ever experimented with at home or been served at a restaurant? PS: This is my 500th post!!! Crazy. Wow, that looks amazing Beth! 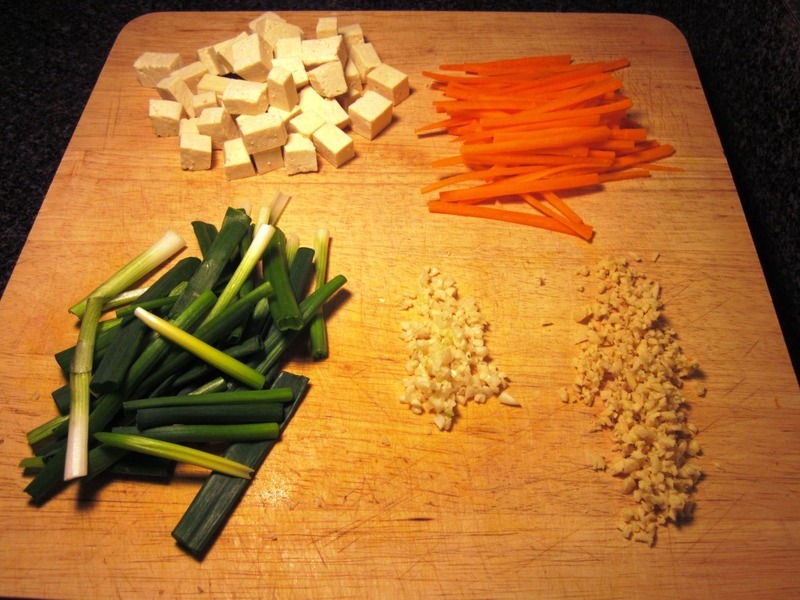 I’m so jealous–now I really want to make a stir fry. How’d you make the coconut rice? Recipe coming soon, but I used light coconut milk, water, and ginger. It gave it a subtle coconut flavor and made it so creamy – delicious! I’ve never seen one of those before. It is really pretty. It looks like a loofa when it’s intact. I love discovering new foods. It’s so rare when you’re an adult. I can’t wait for the coconut rice recipe! I bought some light coconut milk last week to make some Thai curry sauce and it’s just begging to be used. 🙂 Love Asian food! Yum Beth! That looks great! Congrats on your blog btw- I check it out often. You’re doing a great job! those are so cool looking! i feel like i’ve heard of them before but never seen them. what a fun new ingredient! This looks so good! I may have to go out searching for these! I’ve seen them before but never knew anyone personally who has cooked with them (that I know of anyway). Would you also be able to boil them and mash ’em up like mashed potatoes? 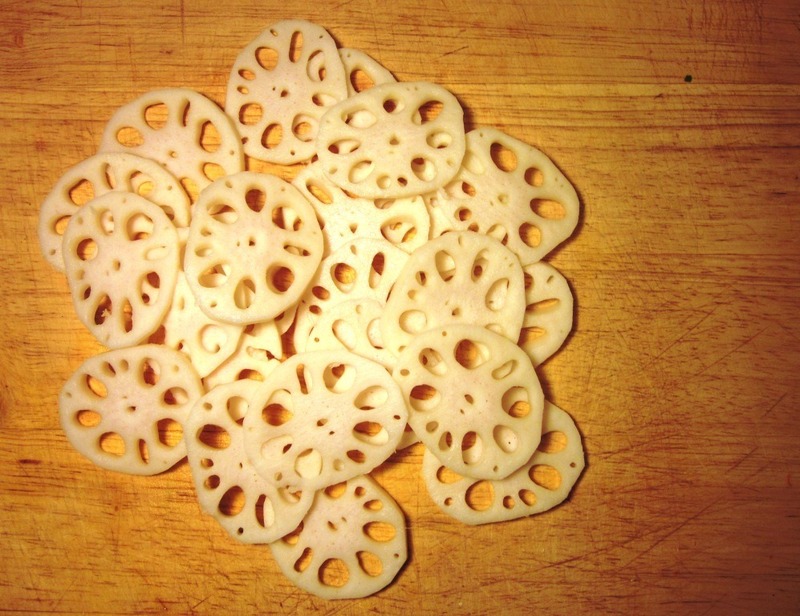 I’m making stir fry tonight for dinner, but not with lotus root. My stir fry will be jealous of your stirfry. BTW congrats on your 500th post! I don’t think I’ve ever cooked with something that exotic! me neither.. until last night! i’m sure it will be! fresh ginger made a world of a difference! Wow 500 is crazy! I think I just reached 100 today, and that seems like so many! Congrats girl! 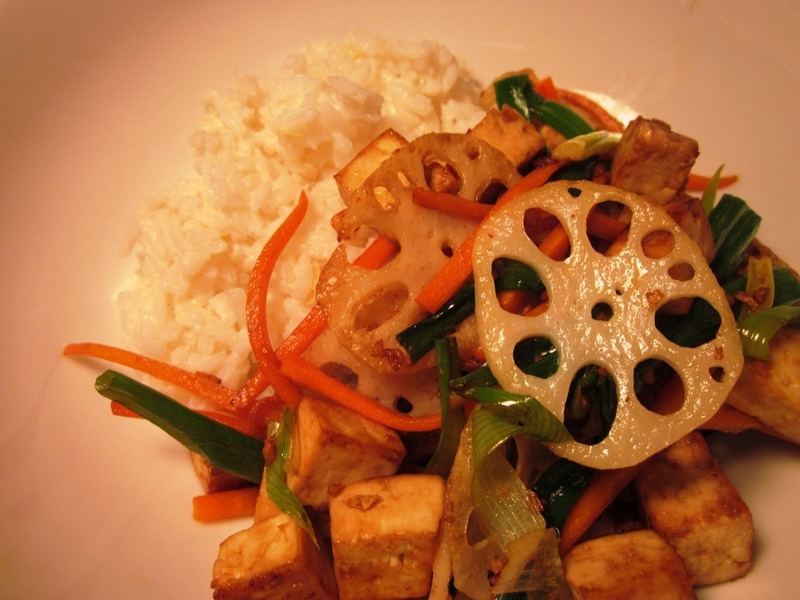 I’ve only ever had lotus root pickled I think–the saute looks great! And, of course, gorgeous! 100 is a lot too! I’ve gone from blogging a few times a day, to twice a day, to now once. It works well for me! Happy 500th girlfriend! 🙂 I haven’t seen lotus root before but I remember wondering what you were going to do with it when you Tweeted about it. Looks delicious. I’ve NEVER heard of it or seen it before. It looks so pretty! I will have to find it and give it a try. What are the calories/points in something like that? Is it the same as a potato or a veggie? I know so pretty right!? On WW it has no points and calorie wise there’s 40 in half a cup cooked. Not bad! I have to try this, it looks so fun, different, and yum! mmmm i really love lotus root so much! theres a really nice crunch to it yet has a bit of a potato taste to it as well. i think i like it so much because as a kid i would eat raw potato..my mom would get so mad and say “you’re gonna get worms” lol but the taste was so yummy to me! I’ve tried…I think cherimoya, which I didn’t like and my mom has had sea cucumber in Taiwan! 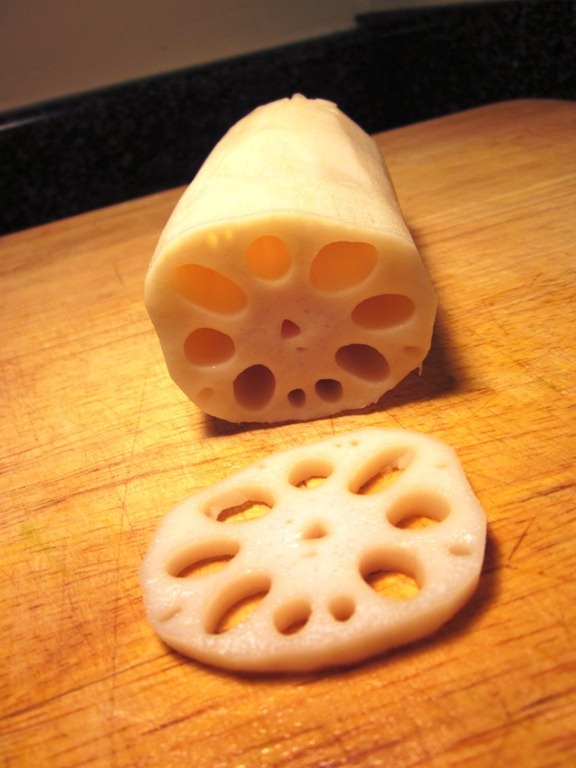 I’ve eaten lotus root before, but I’ve never cooked it! I think it’s super pretty though! The stranges fruit I’ve ever eaten? Rambutan! It’s a little chinese… grape-like fella, with a shell you peel and a spongy texture. Then there is a seed in the center. Oddest invention ever! What a fun dinner! I always love how creative you are in the kitchen. I have never heard of lutos root before, but it looks really good. My Mom cooks with a lot of exotic ingredients, but I am not yet that brave to try unique things. Lotus root is so good, I love it in stir fries or chinese hot pot! Could you PLEASE tell me where you purchased your Lotus Root. I’m in Harrisburg, PA and am ready to travel to any number of near by cities to get some. Looking for this product for it’s medicinal benefits and would appreciate any help you might provide.